NETWORK FINALS: Game 4 of the NBA FINALS adjusted up to 6.8. CABLE HIGHLIGHTS: HBO’s REAL TIME WITH BILL MAHER benefited from the controversy over his previous episode to the extent of topping Friday cable, but the rating was only up 0.02 from last week to 0.46. A&E’s LIVE PD dropped 0.11 to 0.42. MSNBC’s RACHEL MADDOW SHOW continued to dominate cable news in the 18-49 demo at 0.37, with the 2PM hour of CNN’s NEWSROOM coverage at 0.28, and Fox News’s TUCKER CARLSON TONIGHT at 0.23. Adult Swim’s WILLIAMS STREAM is eating up pre-dawn, with its 15-minute episodes at 0.35/0.31, compared to last week’s 0.33/0.31. VH1’s RUPAUL’S DRAG RACE rose 0.03 to 0.32. History’s ANCIENT ALIENS fell 0.03 to 0.29. Nickelodeon’s noon NELLA THE PRINCESS KNIGHT hit the Top 15 at 0.27. On HGTV, HOUSE HUNTERS INTL ticked down to 0.27, MY LOTTERY DREAM HOUSE was also down a tick to 0.26, and HOUSE HUNTERS fell 0.05 to 0.26. 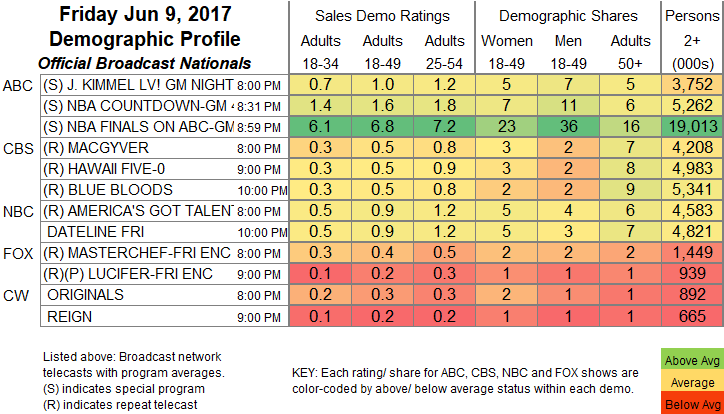 Disney Channel’s primetime ANDI MACK gained 0.02 to 0.26. 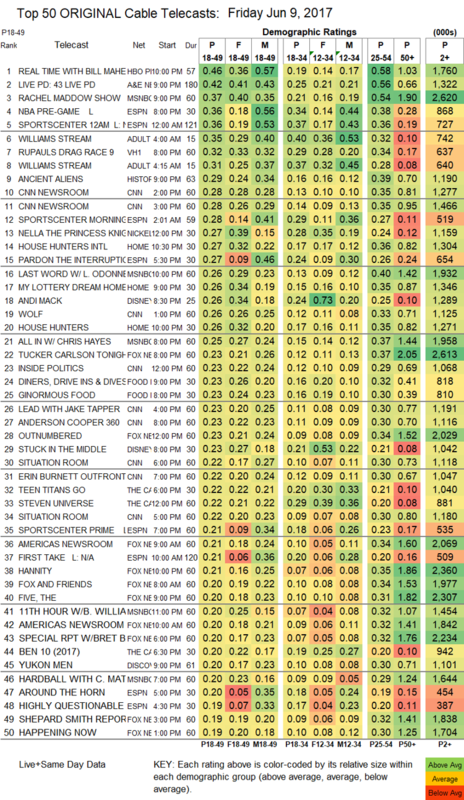 On Food Network, DINERS, DRIVE-INS & DIVES was at 0.23, and GINORMOUS FOOD was steady at 0.23. Discovery’s YUKON MEN ticked down to 0.20. We’s MARRIAGE BOOT CAMP tumbled 0.11 to 0.15. Syfy’s DARK MATTER returned with a 2-hour episode at 0.15 (down 0.05 from the 2016 premiere), and the season premiere of WYNONNA EARP was at 0.09, down 0.11 from last year’s premiere and down 0.05 from the 2016 finale.